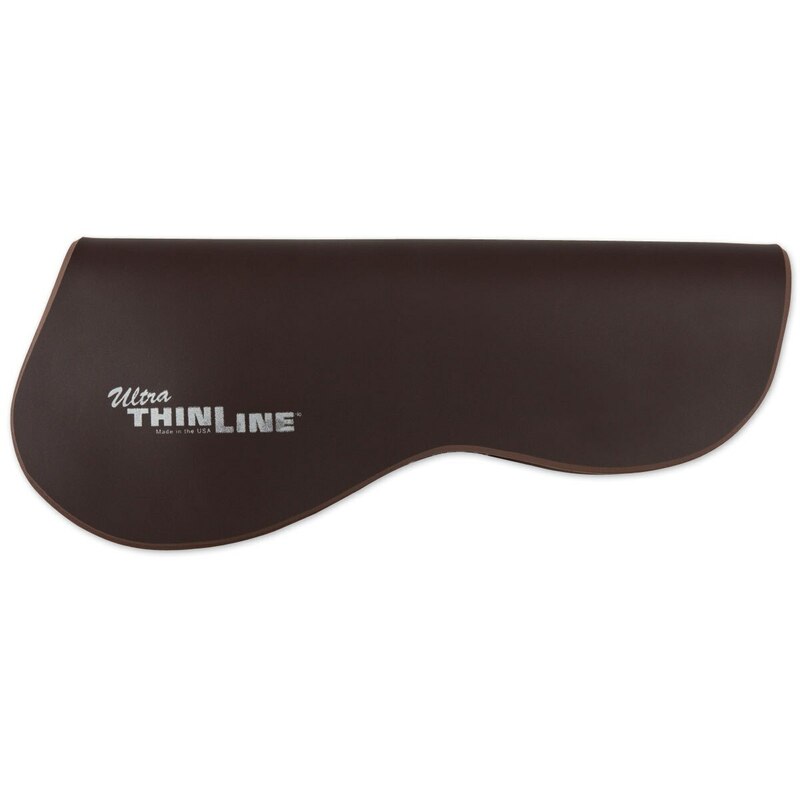 ThinLine Half Pad, Dark Brown - EXCLUSIVE! 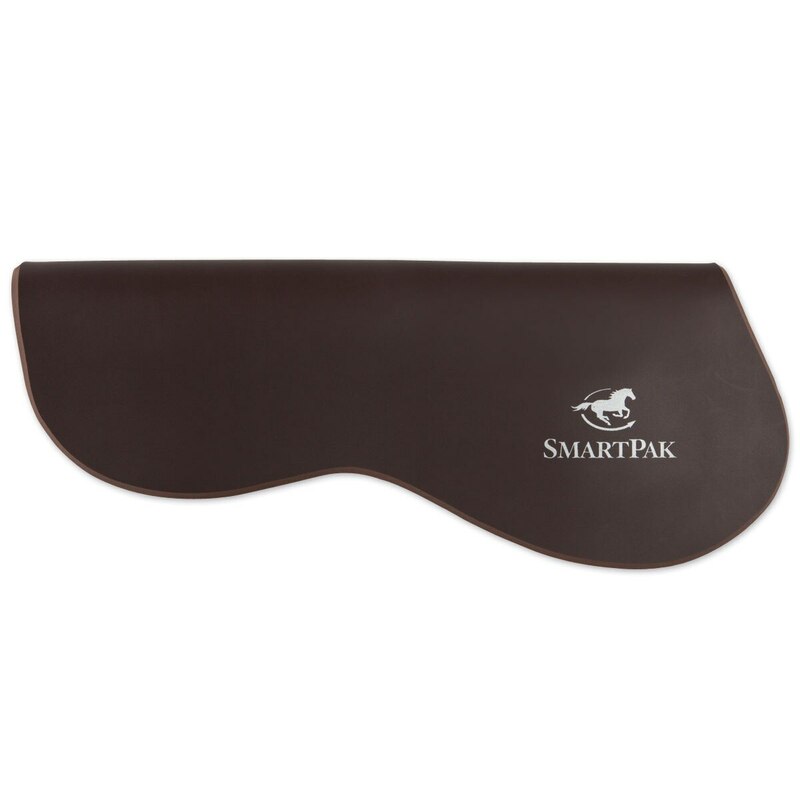 Designed to be minimal and discreet, this Thinline Half Pad is now even more discreet in a Dark Brown color exclusively available at SmartPak! Used under the saddle and over a cotton pad, this half pad covers the weight bearing surface of the saddle and will mold to the horse's shape when warmed to body temperature, providing protection to the horse's back, improved saddle fit, and reducing the rider's movement. Recommended to fit 16-17" saddles. Special Features Can be trimmed to any shape if necessary. 13.75" across the seat, 3/16" thick. ThinLine Half Pad, Dark Brown - EXCLUSIVE! is rated 4.3 out of 5 by 15. Rated 5 out of 5 by Double from More supple I’ve had this for 2 weeks now and have noticed right away that my horse is more free in her shoulders when we jump. She is also more relaxed and free when doing flat work. I bought this because she has now lost weight to be at her ideal weight and this is just what I needed for the perfect fit. Rated 4 out of 5 by horselover2244 from Great! I bought this a month ago because I felt my pony needed something very thin between the saddle pad and saddle to help him. This has done the trick! We have had much better rides and he seems more comfortable and happy when being ridden! Rated 4 out of 5 by Krissand1 from I bought this for a 17" brown dressage saddle and it could be a bit bigger for better coverage. I think it was made to suit jumping saddles best. The thin line material is great as always. Rated 2 out of 5 by SarahG from Good until it cracked Bought this about a year ago and it works great for just that little extra lift my saddle needs. Unfortunately after several months it started to crack on the underside of the pommel area. It didn't seem to affect its use, until recently, as now it is almost cracked all the way through it will be heading back to smartpak shortly, not sure if I will get another one. Rated 2 out of 5 by Paso girl from Wish it was contoured! Thinline is a fabulous product. I was thrilled to order a half pad. And was even glad it was brown bc it matched my saddle. But it was too straight and didn't contour without folding at my horse's withers. How I wish that it came contoured. Rated 5 out of 5 by jebby0723 from works! My horse was getting rub marks on the sides of his withers and seemed sore when I pulled the saddle off. This pad adds just enough to make him more comfortable, without the bulk of sheepskin. Rated 5 out of 5 by greyjumper9 from Love! Love this pad! The brown color makes it perfect for the hunter show ring, and I like that it's smaller than the Thinline contour pad. It's very reasonably priced for a Thinline pad too, so I didn't feel guilty buying it, and I noticed an immediate difference in my horse's back once I started using it on him. Highly recommend it! Rated 5 out of 5 by Jo trot from Love these pads I have a white version of this pad and bought the dark brown so I'd have one for both horses when a friend goes riding with me - and because the white one is no longer white enough to use at shows! So awesome for my back and the horse's backs. My hanoverian used to be sensitive in his back when you'd brush him but not since using the ultra thin line pad, which I started doing 2 years ago.